I've been working on my body composition for some time now. The scale really hasn't been my friend lately (but it hasn't been my enemy either though - sort of detente perhaps). The lowest scale reading (PR?) was right before my accident and it has been in a narrow range slightly above that magic number since then. On one hand I look at that as not great but rationalize that since my training volume has gone down it isn't that bad. On the other hand, the accident was three months ago and I'm getting frustrated. Yes, I do take a few liberties with the rigidity of the diet (OK, maybe more than a few at times) but I've recently renewed this as focus item. I'm feeling body composition changes but needed an objective sign since I'm not getting it from the scale. Fortuntely, I've recently got a couple of them. 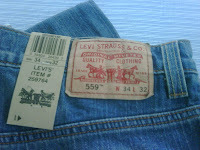 The first sign was that my jeans were loose even though they were a 36" waist. I went to the store (in this case Costco) and got a pair of 34s to try on. I wore 34s in high school (yes they had jeans back then) and remember that there was one fleeting moment later in life when 34s were my size (for reference when I started this weight loss/active journey I was growing out of my 44s) . I figured if they didn't fit now I would put them somewhere that I would continually see them for use as body composition motivation. This plan won't work BECAUSE THEY FIT NOW! Yes, there is a little muffin top going on but I've had that since it was called Dunlap's disease (my belly has "done laps" over my belt). Let's see if they still fit after they go through the wash cycle but I view these new jeans fitting as a good sign. The picture above is of the actual jeans. The second sign was I felt that my wedding ring was getting looser and looser. I didn't want for it to fall off and get lost. I've worn this ring 16 years and never had to resize it up or down. The jeweler looked at it, measured me, and figured the ring should go down 1 whole size! The ring just came back and although it felt a little tight, the smaller size fit. Good signs, yes. Progress, yes. Now we just need to end detente to get that scale working the right way and keep it going that way. Those off-scale signs are awesome! Hope the scale gets moving in the right direction soon! Wow, congrats on the new pants size!! Now that you have your wedding ring resized, you can never go back! Great stuff joe! i love seeing my pants get down to a smaller size. i refused to go to a size 40 and had some serious muffin top issues before i found triathlon. i had the dunlap's disease real bad too. now that everything's getting more under control, the 36's are getting too loose, and the 34's don't quite fit yet. it's fun to see that kind of progress! Congratulations on fitting into the smaller jeans! And the smaller sized ring! How a weigh-in is like a threshold test. Sabbatical over: What have I learned? she said I need a goal | Sometimes training for and sometimes racing triathlons. You Fools! These Robots Will Kill Us All! You Run? No, really, you run? Injuries...bad luck...I need a dog. copyright 2008-2015 rockstartri.com. Simple theme. Powered by Blogger.